Trust and respect. These are two intangible qualities that most of us would like to think we get from the people with whom we live. We believe everyone around us holds the spirit of the Bostonians who, when bombs went off at the marathon, ran toward the sound to help, rather than away to flee the scene. We trust our fellows to care with a minimum of human decency, and maybe more. When we find out that those around us do not live up to those standards, the disappointment and despair can be hard to shake. In 2008, LGBT Californians awoke to the fact that the assumption of trust in, and respect from, our fellows was not a given, and maybe we should not have been so naïve. It was a day in November. The night before, the United States had elected its first African-American President, but in California, that historic news was stained by the fact that a majority of the voters had withdrawn marriage equality from the LGBT citizens of the state. Besides the long struggle that the event set off, which would last years and end up at the Supreme Court, it revealed to me a crushing reality: the kindness and respect that I extended to all the people of my day was not in fact returned by all of them. The defeat brought on by over half of the voters meant that some of my associates, neighbors, and even “friends” had been moved to vote not to allow me to pursue the same family happiness that they could. When these people shared stories of their families, their spouses, and their hopes, I listened and sincerely wished the best for them. These wishes apparently were not reciprocated. The bad taste this left was betrayal, and, because their cruelty was done in the secret of a ballot booth, it also left a dose of near paranoia. I was reminded of those feelings this week when I read a story from the newspaper in my old hometown of Palm Springs, California. When I was 15 there, I got my first job at the Camelot Theatre. It was a great job and the theater was in its heyday. It was immaculately kept with gleaming spotlights and tall majestic pillars. It was the scene of numerous movie premieres including Mame, which Lucille Ball herself attended. She blew kisses to all of us waving to her from behind the candy counter. I thought back to my very first experience at the Camelot Theatre. I started my job on the very first night that the movie The Exorcist opened. The lines were huge and my job was to herd customers into their proper places. The movie was landmark, a tale of a young girl possessed by the devil, and I have to tell you that we felt the effects of the movie’s theme in the workings of the theater. Some in the audience reacted to the grotesque vomiting scenes by doing likewise into their popcorn cups. This made a horrible stench in the theater which we were unable to air out between showings; this made for more retching from later audiences. One evening, I waited on a man in the lobby who was so freaked out by the film that he drew up straight as a board, and fell backwards in a dead faint. Decades later, whether because of demonic influences, or just a whole lot of stink, there is something that reeks in the new Camelot Theatre. In the Palm Springs Desert Sun, Roger Tansey reports that Rozene Supple, the theater’s owner, was performing a little of her own kind of evil. While her theater presented art and LGBT films, including the gay Cinema Diverse film festival in its entirety, attracting gay-friendly dollars, she was sending some of her profits to a list of anti-gay powers, including Michelle Bachmann, Alan West, the Proposition 8 campaign, and the current one-man roadblock to the passage of ENDA, John Boehner. I would love to believe that her donations were the result of her smaller government-less regulations mindset, but I don’t. Why? The list of people and causes on her list are not the predominant crusaders for those fiscal issues. The Prop. 8 campaign existed only to harm LGBT lives, period. Michelle Bachman and Alan West rested their political brands on being anti-gay. 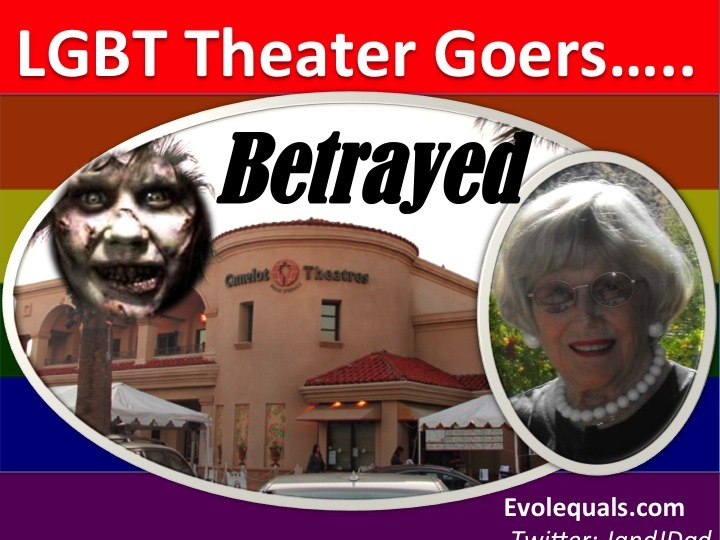 It is also nice that she supported gay causes and did not charge the film festival, but the marketing cynic in me knows that in order to attract the clientele the theater needed, courting the community was necessary. From my years of working for the Camelot, I also came to understand movie theater financial management. The ticket revenues do not go to them, they go to the studios. Not charging Cinema Diverse would have been understandable. The money Camelot would make at such events would be from the inflated soda, popcorn, and concession sales. I don’t believe Rozene Supple was oblivious to the donations she was making. I believe that the progressive and LGBT patrons who feel betrayed and tarnished by the actions have every right to those feelings. It is a reality for us that some of the support and affection we receive still has the taint of homophobia in its weave. Every so often, one of those supportive pats on the back holds the knife of an inadvertent back-stabber. I believe this because my parents are like Rozene Supple. I can’t say that I understand her mindset, but I have observed it. My parents are of her generation and are full Fox-News-loving, Rush-Limbaugh following, dyed-in-the-wool Republicans. They are completely supportive of me, my partner, and my family. They would dance at my wedding, but they are literally in love with their political icons, including the anti-gay ones. The comment was so mind-numbingly bizarre that it was all I could do to keep my eyeballs from spinning right out of my head. Should I have started by informing my mother about the thousand ways her Republican party is doing nothing but essentially seeking the demise of my “gay lifestyle”? Or should I point out to her that, unless she has secretly stashed billions away somewhere without my knowledge, her Republican Party is not a friend to her fixed-Social-Security, Veterans-pension, Medicare-supported lifestyle either? No. She was beyond reason. She and Rozene are in love. They are in love with decades long gone by and the political party that lies to them and tells them that it can return them to the rose colored editing of that past. It dazzles them with Anglo-Saxon style and class, and makes them believe that their betrayals are values, and that their insensitivities are causes. It does not excuse the betrayals however. Those are real, and they hurt. People like my mother and Rozene have been seduced by the powers that be who would prey on people for whom life has moved too fast and changed too much, and who feel the way of life, on which they thought they had a firm perch, has been left in the dust. That, or . . . the devil has possessed them all. You decide. This entry was posted in Civil Rights, Entertainment, Family, Hatred, Living, Marriage equality, Politics, Prejudice, US Politics and tagged Alan West, Camelot Theatre, Cinema Diverse, Michael C. Green, Michelle Bachmann, Palm Springs, Roger Tansey, Rozene Supple. Bookmark the permalink. This is a great piece. robw77 perfectly articulates how my husband and I felt that awful November morning in 2008. My husband and I were married in August of that year on our 17th anniversary as a couple. All of our immediate family, their spouses and our closest friends were with us and it was a fabulous day. And, in spite of all our efforts to remain hopeful and keep our attitudes positive, the passage of Prop 8 did cast a shadow on our wedding day. Again, great writing and thank you! Thanks so much for sharing that Gordon (and the kind words!). I wish many blessings for you and your husband. I do appreciate your feelings over the people who attended your wedding. I do support freeing one’s self from bitterness, but what you described is a real and profound duplicity. My goal in being visible and sharing is to help insure that our future LGBT brethren who marry will do so with far more sincere support. I wish that for you and your family, and hope in the short years since your wedding people have grown. You deserve their total respect. I wonder if this former employee has actually spoken with Ms. Supple prior to writing his column. It would be sad indeed if the author’s definition of Ms. Supple’s viewpoint is based solely on his experience with his mother. In addition, while I find the comparison of Ms. Supple’s donations to The Exorcist ridiculous, I believe it was through dialogue, faith and ultimately by taking on the demon oneself that the young girl was saved. I read nothing of those remedies in this article. You really took a wrong turn here. robw77 was using the Exorcist screening to make the point that something smelled rotten at the Camelot back when he worked there and something stinks now. I think it’s ridiculous that you’re scolding us about dialogue, faith and taking on demons when you have so completely missed the entire point of this piece. My mom cut ties with her brother because of his refusal to accept that I deserve equal rights. Thanks Tim. Her comments were already included in this article . The article above also links to her complete comment. Exactly, The Republican party of today is built on whispering in people’s ears “But at least you aren’t BLACK – or GAY – or (pick a minority).” So they happily keep voting against their own interests because at least they can feel like they aren’t THOSE PEOPLE – even when they ARE.. Your mom thinks you being gay is a “lifestyle”? 1. There’s nothing wrong with being gay. 2. Even if being gay was a lifestyle, there would STILL being nothing wrong with being gay. 3. Being Christian is a lifestyle choice… one that is protected by the federal US Constitution. Therefore, being gay as a “lifestyle choice” is as valid as being Christian. That’s the discrepancy that always comes with some people who admire the Republican party. I can “forgive” the supporters who are so rich they’re against taxes (well, a tiny bit), but why support the same people whose mantra it is to do NOTHING for you? I don’t get it. Two words that should NEVER be used when referring to who a LGBT person is: “Lifestyle” and “preference.” It’s wrong, thoughtless and rude.